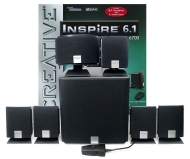 alaTest has collected and analyzed 80 reviews of Creative Inspire 6.1 6700 speakers. The average rating for this product is 4.2/5, compared to an average rating of 4.0/5 for other Camcorders for all reviews. Reviews about the size and usability are overall positive. The price and design are also mentioned favorably. There are some negative opinions about the image quality and reliability, while views are divided on the durability. We analyzed user and expert ratings, product age and more factors. Compared to other Camcorders the Creative Inspire 6.1 6700 speakers is awarded an overall alaScore™ of 77/100 = Good quality. alaTest has collected and analyzed 23 user reviews of Creative Inspire 6.1 6700 speakers from Amazon.co.uk. The average user rating for this product is 4.2/5, compared to an average user rating of 4.0/5 for other Camcorders on Amazon.co.uk. People really like the size. The design is also appreciated, whereas views are divided on the reliability. alaTest has collected and analyzed 30 user reviews of Creative Inspire 6.1 6700 speakers from Amazon.com. The average user rating for this product is 4.1/5, compared to an average user rating of 3.9/5 for other Camcorders on Amazon.com. Comments about the size and usability are generally positive. The price and design also get good feedback, whereas some have doubts about the image quality and reliability. The first song I tested on this was one of professional sound system song tests used on subwoofers in cars. It handled it like a charm and made the windows in the house shake. If you want power go for these bad boys. If these speakers aren't godly, I don't know what is! I love them! Going from SoundBlaster Live! 5.1 with 4.1 speakers to Audigy 2 with these babes was the best thing I ever did. I just got these speakers today and im so happy! I played Warcraft Frozen Throne and Diablo II Expansion and bang these are good. They even work good with onboard sound. I wouldn't recommend it for those who have good ears. But it's OK to me, good sound for such price. From the leader in PC audio innovation, Creative introduces Creative Inspire 6.1 6600 - the first 7-piece PC speaker system to feature a rear center channel. By adding a rear center channel to your desktop entertainment, you'll experience unprecedented positional audio in games, for the same adrenaline rush provided by the front center channel, only directly behind you. With full 6.1 support from Sound Blaster Audigy 2, Creative Inspire 6.1 6600 allows you to maximize your desktop entertainment with Dolby Digital Surround EX encoded movies, and enhanced EAX and Microsoft DirectSound 3D effects in games. With a built-in CMSS upmix switch, you can experience a dramatic 6.1 gaming soundfield with Sound Blaster 5.1 sound cards. And with a wired remote control for volume/bass control and power switch, along with a headphone jack for private listening, Creative Inspire 6.1 6600 provides the most precise positional audio for the best possible games, movies and music experience on your PC.